Winter in the Pacific Northwest can bring snow in the mountains or heavy rains on the coast, but wherever you are in Oregon you're guaranteed a bright forecast during the holidays. holiday light show in the Northwest. • Hosted by Portland International Raceway is the largest light show in the Northwest. 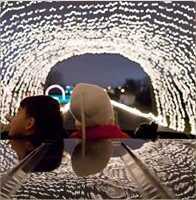 Winter Wonderland is where you can get on the fast track to Christmas fun with a car ride on the famous raceway decorated with more than 250 colorful light displays including 40 animated holiday scenes. • Have fun building your own gingerbread house at the "Gingerbread Construction Zone" held each year in Silverton OR at the Gordon House, the only home in Oregon designed by famous architect Frank Lloyd Wright. • Every year, Oregon is the state that harvests more Christmas trees than any other with 5.2 million, followed by North Carolina (3.5 million), Michigan (3 million), Pennsylvania (2.3 million) and Washington (1.5 million). Oregon Zoo Zoolights - Kid-friendly fun in Portland at the annual holiday light spectacular with almost a million lights and more than 200 animated displays. Christmas Ship Parade - One of Portland's oldest and most spectacular Christmas traditions features a fleet over more than 50 lighted boats sailing on the Columbia and Willamette Rivers. Check out this year's schedule along with an historical overview and photos from past events. The Grotto Christmas Festival of Lights - Check out breathtaking light displays, choral and music concerts, puppet shows, animal petting zoo, and Christmas play performances throughout the holiday season in Portland. Christmas at Pioneer Courthouse Square - Portland's public "living room" for holiday events features the annual tree lighting, Christmas market and the Tuba Christmas music and sing-along. Polar Express at the Mt. Hood Railroad - Inspired by the popular movie, kids are invited to wear their pajamas for a special night of Christmas magic including a visit by Santa, sing-alongs, hot chocolate and cookies. Includes this year's ticket and schedule information. Shore Acres Park Holiday Lights - A quarter million lights in every color of the rainbow glow on trees and pathways, plus featured lighted sculptures and entertainment in the pavilion, and a beautifully decorated Garden House. Ashland Festival of Light Celebration - Lit up like a Christmas tree for the holidays and featuring a parade, visits by Santa and Mrs. Claus, and a winter wonderland of decorated store windows. Oregon Christmas Tree Farms - Where to find them throughout the state by region including those located near Portland, Salem, Columbia and in eastern and southwestern Oregon, with contact details, directions and related links.